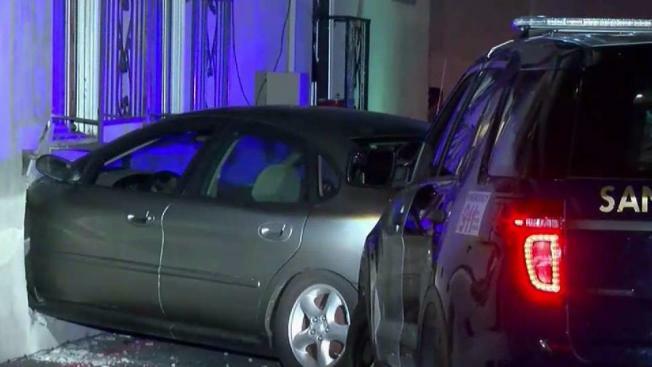 A man accused of opening fire at a group of people in San Jose late Monday was apprehended a short time late after he slammed his car into an apartment building, according to police. Kris Sanchez reports. A man accused of opening fire at a group of people in San Jose late Monday was apprehended a short time later after he slammed his car into an apartment building, according to police. The chaotic string of events began around 11 p.m. when police received a report that a person was brandishing a gun near the area of Winchester Boulevard and Cadillac Drive, San Jose Police Department Sgt. Jessica Welker said. Officers arrived and started to interview witnesses, coming to learn that the suspect actually fired shots at a group of people, Welker said. The suspect then drove by the scene a short time later while police were still talking with witnesses. A brief pursuit began before the suspect crashed into an apartment building near Winchester Boulevard and Colonial Way, according to Welker. He was taken into custody without incident. The suspect was transported to the hospital as a precaution, Welker said. No one else was injured.